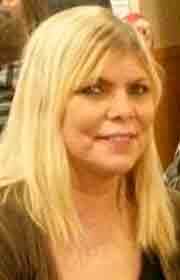 Linda K. (Powell) Scott, of Fort Dodge, passed away Saturday, July 21, 2018, at Trinity Regional Medical Center at the age of 58 years old. Funeral services will be Thursday, July 26, 2018, at 11:00 a.m. at Laufersweiler-Sievers Funeral Home. A visitation will be 4:00 to 7:00 p.m. Wednesday at the funeral home. She is survived by her daughters, Tamara (Jason) Gunderson Evans of Grimes, IA; Jody (Glenn) Lowe of Jackson Gap, AL; Angel Gunderson (Jeremiah) of Desoto, IA; Kelsey Scott (Kyle C.); Katelyn Scott (Keenan), both of Fort Dodge; six grandchildren; mother, Gloria Strange Underwood of Fort Dodge; siblings, Mark; Vern; Dan; Cindy; Tina and her partner, Bill McGough of seven years. She was preceded in death by her father, Vernon Powell. Linda Kay Powell was born January 16, 1960 in Fort Dodge. She attended Holy Rosary School and Saint Edmond High School. Linda was employed with Clean-All for a number of years.